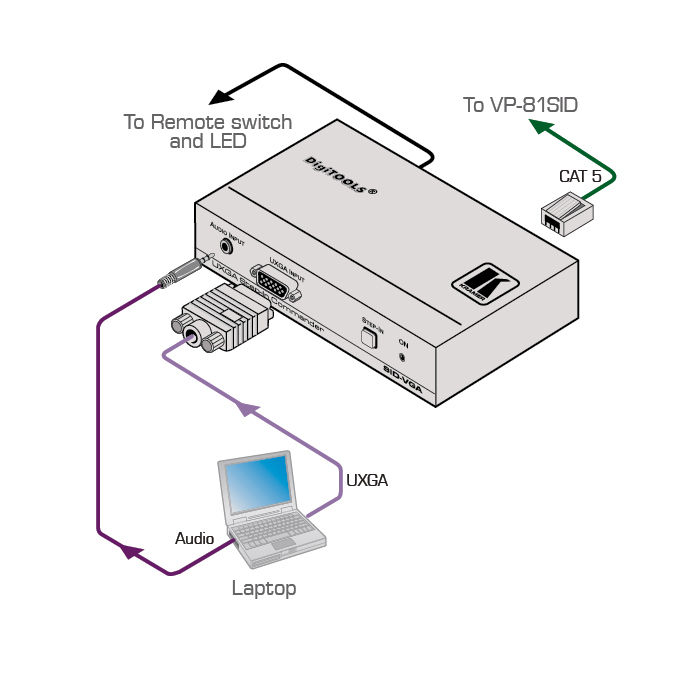 The SID-VGA is a DGKat twisted pair transmitter and step-in commander for computer graphics video and unbalanced stereo audio signals. The unit includes a "Step-In" button that allows the local source to be routed as the active source on the main display through the main switcher. Power Supply - Requires independent power supply. Cable - Requires STP (shielded twisted pair) cable. For optimum range and performance, use Kramer's BC-DGKat623 or BC-DGKat7a23 cables. Note that the transmission range depends on the signal resolution, graphics card and display used. The distance using non-Kramer CAT 6 and CAT 7 cables may not reach these ranges. Use only shielded cable where both ends of the shield are soldered to ground. Control - Step-in button and contact closure.